In most college classes, it’s up to the individual student to decide how hard he or she wants to work to obtain a desired grade. When you climb Gannett Peak, it’s a whole different ballgame. Starting tomorrow (July 28), Jenkins leads eight students in the culmination of a six-credit summer course, where ascending Wyoming’s highest point -- the 13,809-foot Gannett Peak in the Wind River Range -- will serve as the final exam. This is the second summer he has offered the “Gannett Expedition” course. To prepare, students spent 40 hours in class learning geomorphology, glaciology, alpine ecosystems, and map and compass. Students spent close to another 40 hours in the field, learning to climb rock and snow. 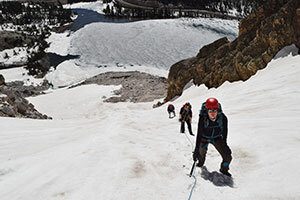 This is technical mountaineering training with ropes, rock shoes, ice axes and crampons. Then, the students had two months of physical training where they ran hills or stairs at least three times a week throughout the summer. Because of its distance from a trailhead, Gannett Peak is the most remote of all of the 50 states’ high points -- even more than Alaska’s Denali, the tallest U.S. peak at 20,310 feet above sea level. 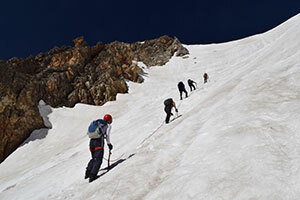 In addition to the lengthy hike carrying 50-pound packs, the group must traverse the glacier and use ice axes, crampons and other gear to reach the summit. Last year, the group climbed Gannett Peak from the east side, coming in from Dubois. This year, the group will attempt the mountain from the west side, entering from Green River Lakes. They hope to ascend either the north face or the west face, depending on conditions. Jenkins says this approach will be more difficult. -- Brittney Buckler, a senior Spanish and elementary education major from Sheridan. -- Ryan Burns, a senior geography major from Laramie. -- Sarah Devine, a senior marketing major from Cheyenne. “I took this class because it was a major personal growth opportunity and also a bucket list item of mine,” Devine says. -- Kaley Holyfield, a senior business management major from Montrose, Colo.
-- Nick King, a junior wildlife and fisheries biology and management major from Cheyenne. “This class gave me an opportunity to do something I wouldn’t have normally tried,” he says. -- Devan LaMere, a junior nursing major from Jackson. “Why not get college credit to learn how to do something I’ve always wanted to do?” she says. -- Joseph Bailey Moore, a computer science and environmental systems science major from Clifton Park, N.Y.
-- Danny Stanley, a junior majoring in both biology, and environmental and natural resources from Wakanda, Ill.
For the second consecutive summer, the group will be accompanied by guide Bridget Belliveau, of Beartooth Mountain Guides, based in Red Lodge, Mont. But the students will pack and cook their own food, and haul their own camping and climbing gear. The end goal is for students to be capable of planning and executing their own mountaineering trip, Jenkins says. He explains this knowledge can be broken down into four categories: academic, physical, technical and field. Conquering a summit is an experience Jenkins believes students will carry with them throughout their lives. Those who complete the course successfully will receive four credits from the Haub School of Environment and Natural Resources (ENR 4890/5890: Gannett Expedition) and two credits from the Division of Kinesiology and Health (KIN 4074/5587: Independent Fitness Training). The UW Outdoor Program also has contributed to the effort. For more information, call Jenkins at (307) 760-4731 or email mark.jenkins@uwyo.edu.